This is the manual for StatSVN, a statistics tool for Subversion repositories. Java version 1.4.x or above. Type java -version on the command line to see your Java version. You can download Java from Sun's website. You need the download called “JRE”. The Subversion command-line client, version 1.3.0 or higher. The binaries need to be on your command-line path when executing StatSVN. Change into the directory where you have checked out the module, and use the svn log command to create a log file. This command creates the reports in the current user directory. You can now point your browser to the file index.html, which is the table of contents of the report. In addition to the required command line parameters, you can use additional parameters to tweak the reports and change the behaviour of StatSVN. A list of all options understood by StatSVN follows. Specify an output directory. The reports will be generated in this directory. The directory will be created if it doesn't exist. Specify filters to exclude files from the analysis. A file will be ignored if it doesn't match any of the patterns in include-pattern-list, or if it matches any pattern in exclude-pattern-list. For example, src/**/*.java matches all java files in the src directory or its subdirectories. Note that *.java only matches java files in the root directory, because '*' does not match subdirectories. This matches all .c and .h files anywhere in the directory tree except those in the legacy directory and its subdirectories. For more information on Ant's wildcard syntax, see the Patternset section of the Ant manual. If not specified, all files will be included and no files will be excluded. Note: Unix users must put the patterns in quotes, or the shell will interfere with the wildcards. Specify a cache directory for information retrieved from the Subversion server (e.g. line counts). The data will be saved in this directory. The directory will be created if it doesn't exist. By default, the current user directory is used. Specify a username to use when connecting to the Subversion server. Specify a password to use when connecting to the Subversion server. Includes information about Subverison tags into the reports. Only tags matching the regular expression are included. To include all tags, add -tags '. *' to the command line. Note: Unix users must put the expression in quotes, or the shell will interfere with the wildcards. Note: Tags are determined by looking at your repository's /tags directory. To be able to use this feature, you must generate the log file from the root of your repository, so that the log contains information from both the /tags and the /trunk. The checked out version does not have to contain the tags directory. Excludes a Subversion account name from all developer reports. This is useful to reduce noise from administrative and other non-developer accounts. Multiple accounts can be excluded by adding the option to the command line once for each account. Generate Maven XDoc instead of HTML. This allows Maven and Maven 2 to integrate the reports when it generates the projects Maven site. Reports could be placed, for example, into src/site/statsvn. Generate XML instead of HTML. Optional (default varies for html or xdoc). Specify a Cascading Style Sheet for the report. This can be a HTTP URL or a local file. A URL will simply be linked in every page of the report. A local file will be copied into the report directory. project, created by StatSVN itself. Specifies a display title to be used in the reports. The name of the Subversion module will be used as default if no title is specified. Allows one to replace the source control username with more information such as real name, website, email and avatar icon. See this file for an example. Specifies the charset to use in HTML or XDOC output. ISO-8859-1 will be used as default if no charset is specified. if present, exclude the Twitter "Tweet This" buttons from the output. Specify the URL of a Chora installation for the module. This must be the URL of the page for the module's root directory. StatSVN will create links to Chora for directories, files and revisions. Specify the URL of a ViewVC installation for the module. This must be the URL of the page for the module's root directory. StatSVN will create links to ViewVC for directories, files and revisions. Specify the root URL of a Mantis bug tracker installation. In commit messages, this will turn “Bug ####” into a link to the appropriate bug. Specify the root URL of a Trac installation. In commit messages, this will turn “Bug ####” into a link to the appropriate bug. Output lots of additional progress information. Output the version of StatSVN. StatSVN doesn't provide options to specify a start and end date for the report, but you can specify a date range in the svn log command to get the same effect. See the dates section of the SVN book for more information on the allowed formats for dates. Interested in learning more? John Brugge wrote a blog post on this subject. StatSVN comes with an Ant task for the Apache Ant build tool. The attributes path and log are required. (Note: path is the directory where the source is located.) The other attributes are optional. The file statsvn.jar file must be on the Ant classpath, or be specified in the taskdef as above. This section lists some limitations and inaccuracies of StatSVN and its reports. Branches: StatSVN analyzes anything it is given. Because of the way Subversion treats branches, StatSVN is not limited to a repository's default branch, as StatCVS was. However, there are currently no special features that take into account the most common Subversion repository layout (with /branches and /trunk). Tags: Tags are currently in beta; please see the command line option reference for details on its limitations. 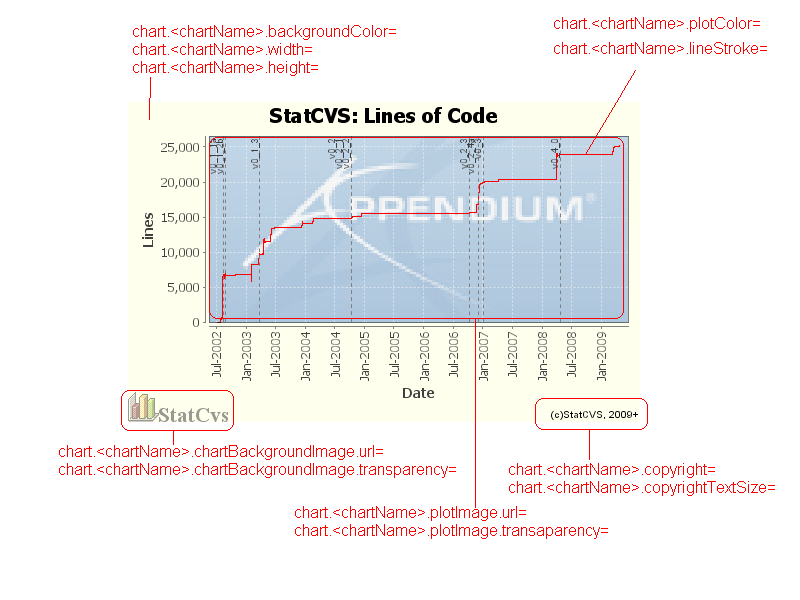 IBM developerWorks has an article on StatCVS (StatSVN's parent) by Tom Copeland. Includes a section on generating reports for several repositories at once and a sidebar on the value (or lack thereof) of LOC as a measure for productivity.